Greenbrier Games ones more takes you to the western-themed sci-fi world of their Grimslingers universe with Grimsligners: The Northern Territory, a new expansion to their battle card game. This is more than just a couple new cards, too. It also refines the core gameplay along with giving you new solo and coop variants for you to try out. The game is up now on Kickstarter. Grimslingers is a strategic, sci-fi fantasy western themed card game, featuring two different modes of play - versus and co-op. In versus, players will go head to head in teams or a free-for-all using a wide selection of spells, items and abilities. In co-op, players will work together through a narrative campaign composed of several chapters that last 60-90 minutes, battling strange creatures, overcoming intense challenges, collecting loot, gaining levels and exploring a truly weird wild west. 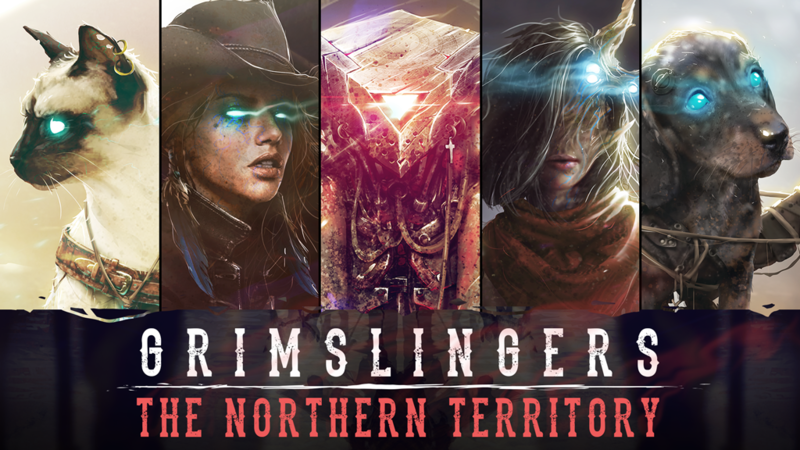 Grimslingers: The Northern Territory is an expansion to the Grimslingers core game, which refines and redefines all aspects of the game, while adding more of what players love. Improved gameplay and strategic choices in player versus player, along with a plethora of new solo/co-op content for players to delve into for many hours. The Kickstarter is doing well. They're already over their funding goal with still 27 days left to go.